This section is about the advanced options which you can find at WP-Lister » Settings » Advanced. In most cases you won’t need most of these options, but they can be useful to customize WP-Lister Pro to your needs. Here you can control which features of WP-Lister are available for each user role. The available capabilities are: Manage Listings, Manage Settings, Prepare Listings and Publish Listings. By default, Shop Managers have full access just like Administrators always do – but you could hide WP-Lister’s settings from Shop Owners to avoid confusing them, or you could allow other users to prepare eBay listings, even without allowing them to publish them. This section contain options that influence how WP-Lister will render your listing template and generate the item description on eBay. By default WP-Lister runs your product description through the usual WordPress content filters which enable you to use shortcodes in your product descriptions in WooCommerce. If a plugin causes trouble by adding unwanted HTML to your description on eBay, you should try setting this option to “off”. Enable this if you want to use WordPress shortcodes in your product description or your listing template. Select whether WP-Lister should replace links within the product description with plain text. WP-Lister does remove links from product descriptions by default to avoid violating the eBay Links policy. Specifically you are not allowed to advertise products that you list on eBay by linking to their product pages on your site. Read more about eBay’s Link policy here. Select the image size WP-Lister should use on eBay. It is recommended to set this to “full” to upload the highest resolution available. In order to get additional product images, WP-Lister first checks if there is a dedicated Product Gallery (WC 2.0+). If there’s not, it can use all images which were uploaded (attached) to the product- as it was a usual behavior in WooCommerce 1.x. If you find unwanted images in your listings try disabling this option. Customize the WP-Lister UI according to your needs. You can change or main admin menu label in your dashboard from WP-Lister to anything you like. For example, you can enter “eBay” and the menu label below “WooCommerce” will read “eBay”. 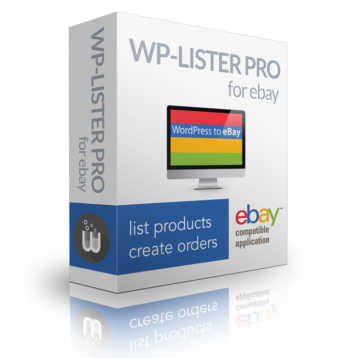 Technically, WP-Lister allows you to list the same product multiple times on eBay-in order to increase your visibility. However, this is not recommended as WP-Lister Pro would not be able to decrease the stock on eBay accordingly when the product is sold in WooCommerce. If you do not plan to use the inventory sync feature though, you can safely list one product multiple times and disable the warning about duplicate listings. Disable New Order notifications being sent to the admin when an eBay order is created. Disable email notifications being sent to the customer when an eBay order is created with status processing. Disable email notifications being sent to the customer when an eBay order is created with status completed. 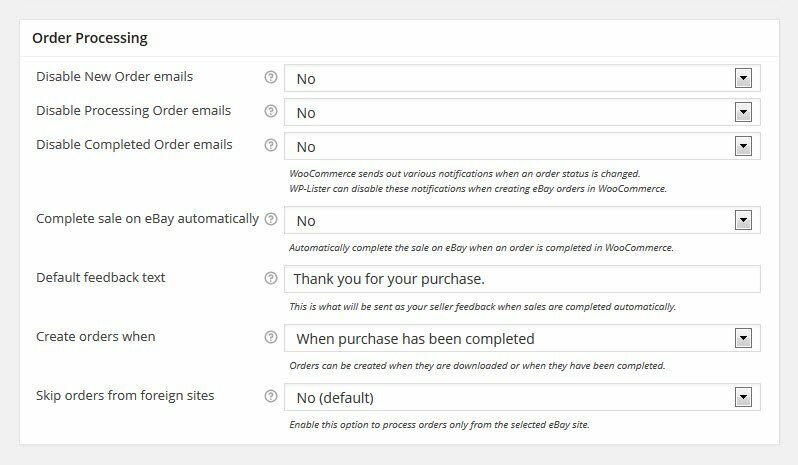 Automatically complete the sale on eBay when an order is completed in WooCommerce. Setting this to “Yes” will complete an eBay order with the default feedback text and shipping date set to today when the order status is changed to completed. Only applicable if the default status for new orders is processing. This is where you can change the default feedback text to be used when auto complete option above is enabled. Leave empty to skip sending feedback. Note: Seller feedback is always positive. Orders can be created immediately when they are downloaded or when they have been marked as “completed” on eBay. It is recommended to wait until the eBay purchase has been completed or combined orders can cause duplicates. Enable this option to process orders only from the selected eBay site. If you use the same eBay account to sell on multiple sites, please enable this option to only process orders from the site selected in settings or you might get orders in the wrong currency as WooCommerce does not support multiple currencies. Select your local time zone. This is currently used to convert the order creation date from UTC to local time. Enable this to show the eBay Item Compatibility List as new tab on a single product page – if it exists. Note: Item compatibility lists are currently only created for imported products. Future versions of WP-Lister Pro will allow to define compatibility lists in WooCommerce. External products usually have no inventory in WooCommerce. This option is a workaround to enable inventory management on external products. Since eBay relies on each item having a definitive quantity, allowing backorders for WooCommerce products can cause issues when the last item is sold. WP-Lister can force WooCommerce to mark a product as out of stock when the quantity reaches zero, even with backorders allowed. Enable this to mark a product as out of stock even when it has backorders enabled. 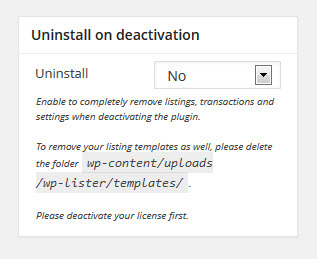 If you ever want to completely remove WP-Lister and all listings, orders and settings from your site, you can do so by enabling the Uninstall option before deactivating the plugin. Note: This will not remove your listing templates to avoid loosing your customizations. If you want to remove your listing templates as well, please delete the folder wp-content/uploads/wp-lister/templates/.